Israeli forces respond to rocket assault with airstrikes as tension between the two sides continues to escalate. 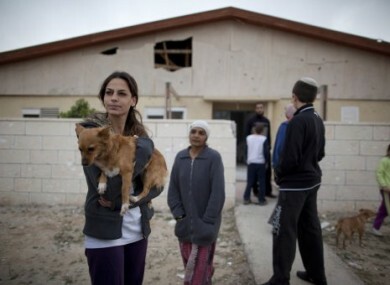 Israeli citizens stand next to a house in Beersheba, damaged by rockets fired by Palestinian militants today. GAZA MILITANTS TARGETED southern Israel with rockets and mortars this morning, drawing retaliatory Israeli airstrikes in a worrying escalation of the gravest hostilities in the area since Israel went to war in the Palestinian coastal territory two years ago. The Islamic Jihad militant group said it fired rockets at four Israeli cities to avenge Israel’s killing of three militants and four civilians in Gaza the day before. The group said one of its fighters was killed in one of the Israeli airstrikes today, and Israeli police said an Israeli civilian was wounded by a rocket that exploded in southern Israel’s largest city, Beersheba. A smaller militant faction allied with Gaza’s ruling Hamas militant group claimed responsibility for the mortar fire. Israel and Hamas have largely observed a truce since the Israeli military offensive in Gaza ended in January 2009. But over the weekend, Gaza militants launched their heaviest mortar barrage against Israel in years, sending tensions soaring. The deaths Tuesday of three Gaza children and their uncle in what Israel has described as an errant mortar strike dramatically stoked the simmering violence. In Gaza, the government declared a national day of mourning Wednesday and appealed to all Gazans to take part in the civilians’ funerals later in the day. Both Israel and Hamas are thought to be reluctant to engage in another war, after the 2009 conflict killed hundreds of Palestinian civilians and heavily damaged thousands of homes and businesses. Thirteen Israelis also died, and Israel’s image was badly tarnished by allegations of war crimes that the Israeli government denies. But although the war inflicted heavy damage on Hamas, the Iranian-backed group has replenished its arsenal with bigger and better weapons. Last week, Israel intercepted a cargo ship that it said was loaded with sophisticated anti-ship missiles and other arms sent from Tehran to Gaza. Email “Gaza militants launch mortar attack on Israel ”. Feedback on “Gaza militants launch mortar attack on Israel ”.